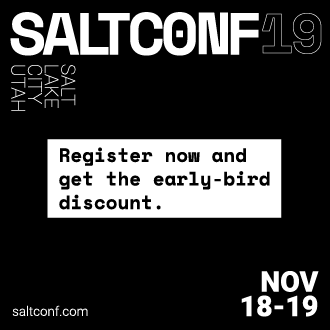 Salt contains a robust and flexible configuration management framework, which is built on the remote execution core. This framework executes on the minions, allowing effortless, simultaneous configuration of tens of thousands of hosts, by rendering language specific state files. The following links provide resources to learn more about state and renderers. Express the state of a host using small, easy to read, easy to understand configuration files. No programming required. Contains: list of install packages, create users, transfer files, start services, and so on. Contains: description of Salt's Pillar system. Contains: a dry vocabulary and technical representation of the configuration format that states represent. Contains: a guide on how to write Salt state modules, easily extending Salt to directly manage more software. Renderers use state configuration files written in a variety of languages, templating engines, or files. Salt's configuration management system is, under the hood, language agnostic. Contains: a list of renderers. YAML is one choice, but many systems are available, from alternative templating engines to the PyDSL language for rendering sls formulas. Contains: more information about renderers. Salt states are only concerned with the ultimate highstate data structure, not how the data structure was created.